Nintendo's console and mascot both sold incredibly well this holiday season, with the Wii setting a new record for consoles sold in a month, 3.81 million. The New Super Mario Bros. Wii, a four player co-op title, was the leading seller for the month with 2.82 million copies sold. Other co-op titles on the list include Call of Duty Modern Warfare 2, which sold a combined 2.75 million copies on the 360 and PS3. Left 4 Dead 2 sold a respectable 728k copies as well on the 360. There's a lot of happy families playing four player co-op this year, hopefully they enjoy it more than we did. 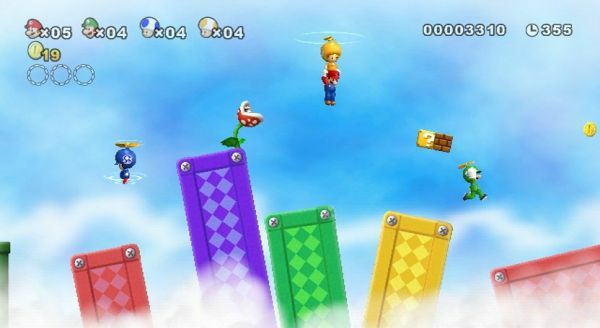 New Super Mario Bros. Wii Features 4 Player Co-Op! Page created in 0.2658 seconds.